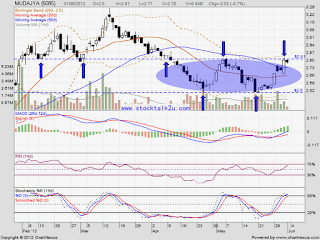 MUDAJAYA retest RM2.81 resistance level. MACD moving toward positive region, uptrend stock. If market sentiment is bullish, high potential it will break through RM2.81 resistance. Else, tt might be consolidate above MA50 / MA20 support level. Subsequent support @ RM2.50 level.